It’s not just America who wants a slice of Hawaiian paradise during these boom times. Foreign buyers too are pouring billions into the Hawaiian housing market and it’s caused what some feel is a housing bubble. Buyers from California, Arizona, China, Germany, Russia, Japan, Canada, and other nations compete for too little real estate resulting in big price increases. Demand from non-resident buyers is an issue in Hawaii. Income rental property investors can find properties here however and might be intrigued by the low new construction climate here. And Hawaii’s peace and serenity, beaches, parks, golf courses, hiking, Honolulu urban life, and culture are irresistible to buyers and tourists around the world. And you never know which tourist will decide to buy property on the Hawaiian islands. 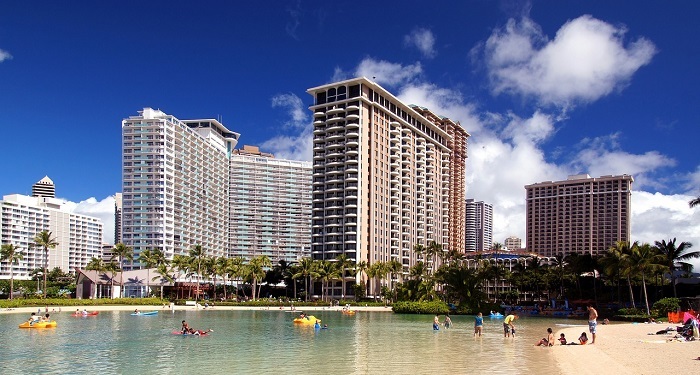 Hawai‘i is a competitive, low-inventory housing market. The growth of purchases in the Aloha state in the last few years is astonishing. Billions of real estate investment dollars have flowed into the Hawaii real estate market in the last few years. Honolulu is the focus of most real estate investment interest. Other experts feel there is no housing bubble and prices will stay steady since US buyers are financially healthy and the US economy looks excellent. The last two months however, have shown a strong cooling down of the Hawaii housing market. Is this an opening for rental property buyers and resident home buyers? What’s the 2019 forecast for sales and prices? Hawaii is the least affordable state in the union, and prices may rise further in 2019. Days on market grew 6 days to 27 and there are 1.1% additional months of inventory. Active listings jumped by 367 in January. The average sales price was $967,119 in January which was up almost $30,000 over January 2018. New listings have risen 117 units. Note: if you’re interested in International real estate, please check out our post on the Australian housing market. Are you located in Honololu? Come meet us at the Hawaii Buildings, Facilities & Property Management Expo on March 6th and 7th 2019. Zillow’s average home price varies from NAR’s and the Oahu Realtor’s estimates. The trend however has been strong except for the last two months. Zillow expects the price rise to continue through 2019. 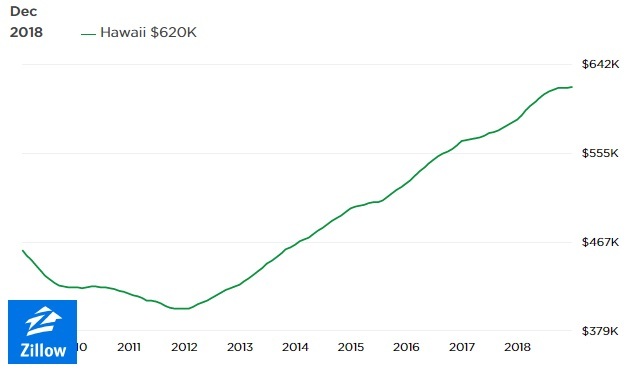 In the Honolulu condo market, the median price fell by $31,000 yet the average price rose by $340. 600 more condos are listed than last year, and sales dropped by 50 units. 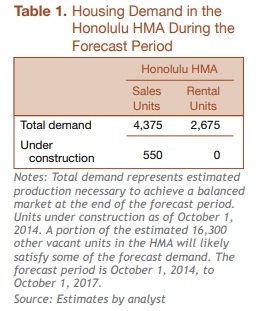 Given the size of Honolulu’s housing market and population, the market supply is severely constrained. Millions of new apartments are needed across the nation and in Hawaii. 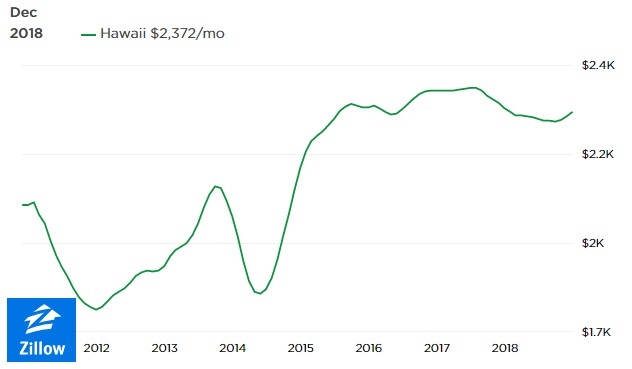 According to stats from the Honolulu Board of Realtors, the median sales price of a house in Honolulu is $767,500 which was .6% less than January of 2018. Hawaii’s economy is very dependent on US overall economic activity and upon Japan’s economy as well. During third quarter 2018, visitors to Hawaii increased 4% and job growth also grew a strong 2%. Unemployment is ultra low at 2.3%. 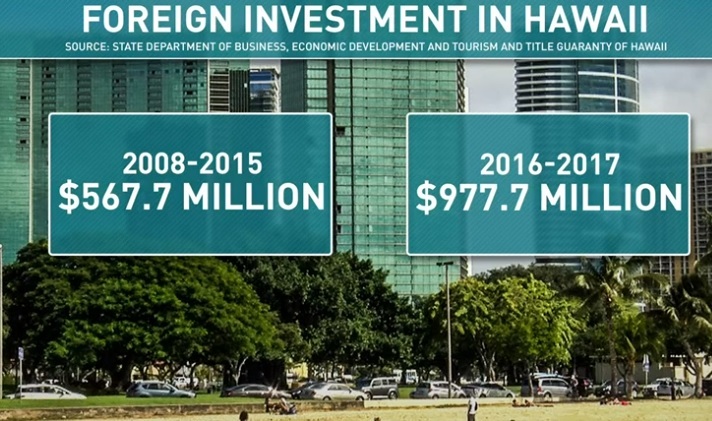 In the first half of 2018, Hawaii’s GDP increased $2,545 million or 2.9% from the same period of the previous year. GDP is predicted to grow 2.6% for 2019. 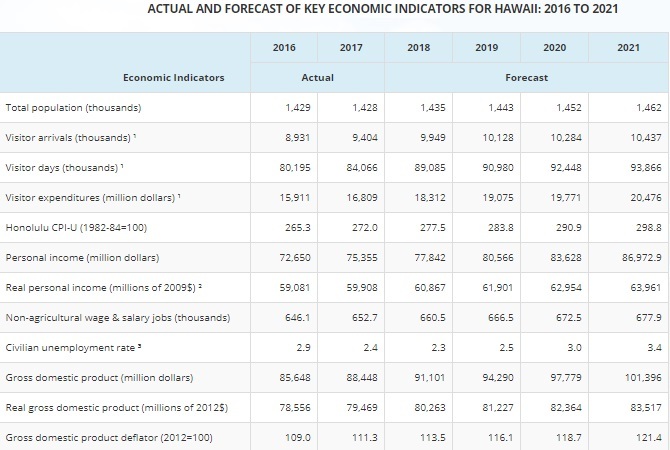 Hawaii’s real GDP growth is expected to increase 1.4 percent in both 2020 and 2021. Wages are rising and that should support higher apartment rental prices. Similar to most housing markets in the US, Hawaii lacks housing supply which drives up prices. Another factor comes from lending rates affected by Hawaii’s unique real estate laws. Buyers who buy leasehold properties may not qualify for 30 year mortgage rates. Hawaii real estate is offered in two different types: fee simple and leasehold. With fee-simple property buyers have complete ownership of the property, which includes the land and any improvements to the land in perpetuity. Leasehold ownership on the other hand means the buyer does not own the land; instead, they have a right to use the land for a predetermined amount of time. When the lease is up, the land reverts to the lesser. If you’re buying multifamily property, these rules could pose a problem. Hawaiian lenders may prefer owner occupied property financing, and those investing in rentals may face higher financing costs. There are residency requirements to qualify for government backed Fannie Mae or Freddie Mac loan programs. 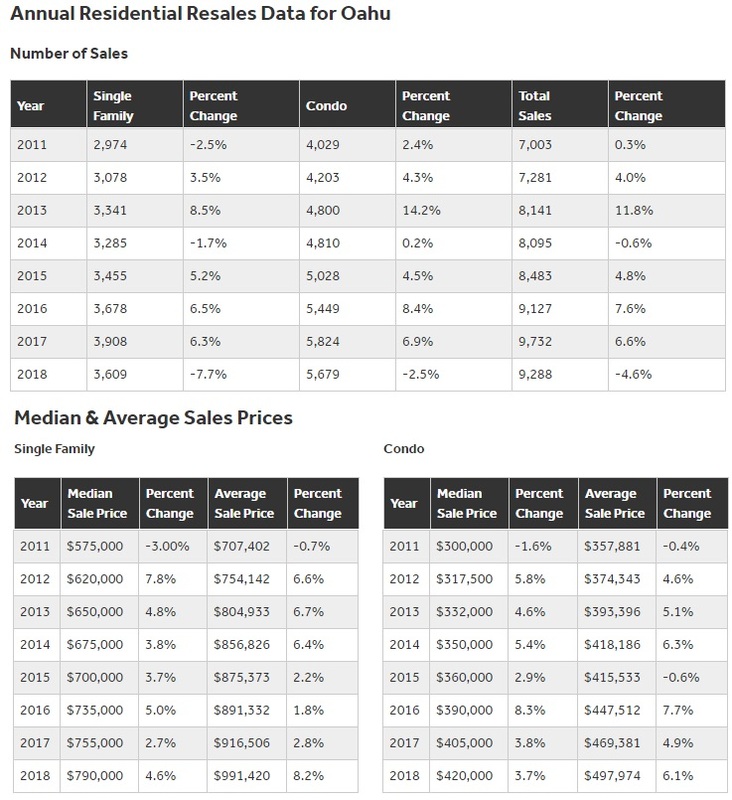 This chart showing the Oahu housing market sales and price stats, reveals 2018 hit the skids with sales, but not price. It’s a similar pattern in other similar housing markets including San Francisco, Los Angeles, San Diego, Phoenix, and Las Vegas. 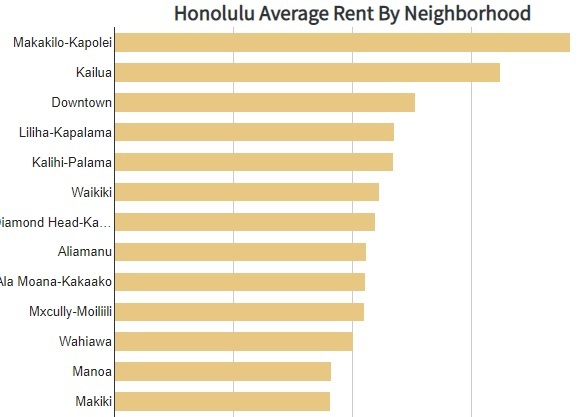 Although apartment rental prices have declined in the last 12 months, Hawaii is one of the least affordable states to rent or buy as a rental property investor. Limited supply translates to big rent increases. Rental prices may be falling, however prices are often beyond the reach of many Hawaiians. Contrast apartment prices to those across the US. 1, 2+ bedroom rentals in Hawaii average about $1600 a month which is down$600 from one year ago. 2+ bedroom units average about $1700 a month which is down about $700 from 1 year ago. 1 bedroom apartments are down by almost $400 a month as reported by Rent Jungle. If you’re looking for a home to purchase in Honolulu, Hawaii, check out Honolulu Magazine.